FLATIRON — No Idea Bar is closing its doors for good this Friday — but its owner is planning to open a smaller bar with a new name just a couple blocks away. 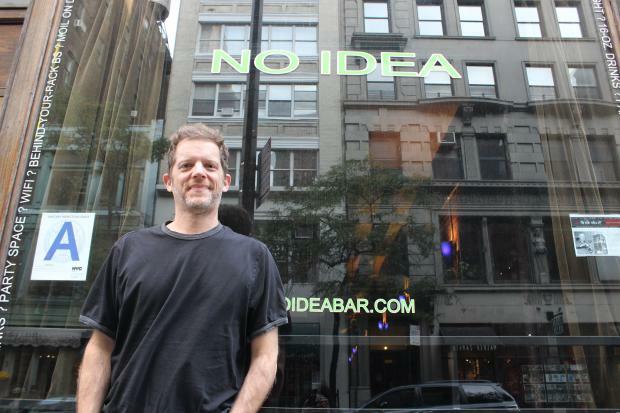 The 21-year-old No Idea Bar on East 20th Street — known for its "Name Night" drink special, where lucky patrons with the bar's "name of the day" win a night of free drinks — will relaunch as One Star Bar on West 24th Street within the next couple of weeks, owner Joe DiPietro said. DiPietro said he was priced out of his space at 30 E. 20th St., which features a pool table in the large back room, after the landlord sold the building to a company called 30 East 20 LLC, and the new owner asked for more rent than DiPietro could afford. "They don't want an ugly duckling here," DiPietro said. A representative of 30 East 20 LLC did not immediately respond to request for comment. DiPietro, 50, found a new space at 147 W. 24th St. — where there will be a 50-foot bar and 40 seats — but he decided to leave No Idea's name behind. "I couldn't answer the phone and say No Idea anymore," DiPietro said. "I got the idea for One Star by looking at the Yelp reviews for the [No Idea] bar. There were a lot of good reviews, but the bad ones with one star were so funny. "I'm not shooting for anything five-star," DiPietro continued. "I'll take one star and have people have a sense of humor about it." DiPietro plans to open One Star Bar soon and will restart the "Name Night" specials in December. But instead of getting free drinks from 5 to 11 p.m., anyone with the nightly chosen name will have to pay $1 for the night of drinking, DiPietro said. "I won't say free anymore, because that's a fire alarm for some people," he said. Although he runs the business alone now, DiPietro originally started No Idea Bar with a partner, after leaving college and briefly working in advertising. "We really didn't know how to run a bar," said DiPietro, who lives in Park Slope. "That's why we called it No Idea at the time. On the first night, we had no singles...no cranberry juice. We were best at drawing the people in."